Wheelchair accessible - computer on height-adjustable table is available on level 3. This computer includes reading and speech recognition software in addition to the software available on all public computers in the library. Priority is given to students, faculty and staff who wish to use the assistive technology software or who require an adjustable height table. The Mansfield Library provides an array of hardware and software to facilitate research and study. Read & Write, Gold supports struggling readers and writers, those with literacy difficulties (including dyslexia) and English language learners, through a host of reading, writing, and study/research features. Read & Write, Gold is supported on Windows, Mac, and iOS platforms and is used globally in education, the workplace, and at home. Read & Write Gold is a floating toolbar allowing users to access Read & Write, Gold features from within other programs such as Word, web browsers or PDF readers. WYNN (What You Need Now) will scan and read print documents and books back to you. WYNN reads word processing files, web sites, e-mail, text-only DAISY format, Adobe .PDF and scanned documents aloud, and provides a variety of tools to help you read, learn and understand the material you are studying. WYNN can enlarge the displayed text, increase line and word spacing and decrease column width to improve access to text material. WYNN provides language tools, including a thesaurus, a dictionary, a pronunciation guide, and spell-check. Open Book scans and reads back print documents to the user. It is built for blind and low vision users, relying on keyboard commands rather than "point-and-click" functions using the mouse. Open Book can also read Adobe .PDF files, any word processor or other formats, including formatted digital Braille files. Open Book has bookmarking features, and can translate files into electronic Braille formats, as well as back-translating them (out of electronic Braille format). FS Reader is installed on all Windows machines that also have JAWS. It is able to play audio DAISY formats from RFB & D as well as text-only DAISY from Bookshare.org and from our Alternate Materials department. Book Wizard Reader reads audio Daisy format books from Recording for the Blind and Dyslexic (RFBD), which come to the student on CD. It also will read text Daisy format titles from Bookshare.org using the SAPI voice synthesizer. Book Wizard Reader plays these specialized formats, allowing easy navigation between chapters, pages and sections of the book. Daisy books, or Audio Plus as they are called when coming from RFBD, cannot be played in standard MP3 players or iPods CD players or with your computer's media software. Videophone access for the deaf and hard of hearing is available on level 3 near the computer lab. The equipment is available for public use. Windows Accessibility provides convenient, centralized place to locate accessibility settings and programs to make your computer easier to use. For Windows version 7 The Ease of Access Center can be found in the Control Panel by selecting Windows logo key+U and also when logging into Windows. For an overview of Windows 7 accessibility features see the Windows 7 accessibility help page. For basic questions about the library's technology and software ask for assistance from the tech support staff at the Information Center on level 3 or visit our technology support page online. For a list of equipment and software that you can use at the library see our equipment checkout list. Need additional technologies or prefer different software? Please contact Teressa Keenan to suggest how the library can improve this space. 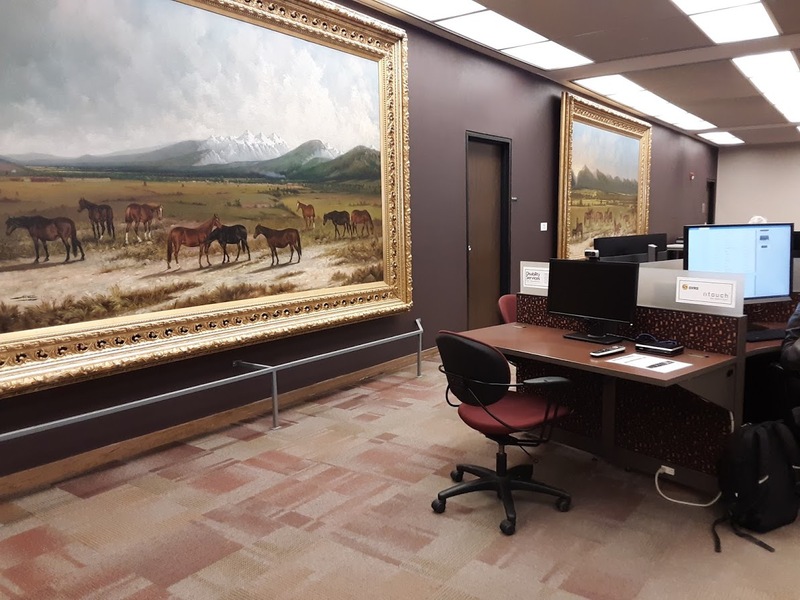 Room 209 on level 2 of the library provides a quiet area that is reserved for students, faculty and staff to use for research and study. A variety of specialized accessibility hardware and software is available for use any time the library is open. To access this room check out the key from circulation staff at the Information Center on level 3. The area next to the study rooms, near the emergency exit at the library provides equipment focused on accessibility and DSS student needs. Assistance is available at the library’s main desk.